AMMAN – Under the patronage of HE Dr. Talal Abu-Ghazaleh, the Arab Poetry Forum in Baakline, Lebanon organized a poetry evening at Talal Abu-Ghazaleh Knowledge Forum attended by intellectuals, diplomats and representatives of the Embassy of Lebanon in Amman. Linguistic science researcher and the author of ‘Mo’jam Ajaeb Al-Lugha’ 'Dictionary of the Wonders of (Arabic) Language’, Mr. Shawki Hamadah made reference to some unusual words in the Arabic language including ‘barnamej' (program), ‘dostour' (constitution), ‘jahanam' (hell), ‘mosiqa' (music), adding that the Arabic language has more than 12 million words. Vice-President of the Arab Poetry Forum Dr. Hadi Eid read some of his poems and expressed happiness to meet intellectuals and scholars in Jordan. For his part, poet Ghazi Saab recited some Arabic poems about the state of the Arab nation expressing hopes that peace will prevail in a unified Arab world. 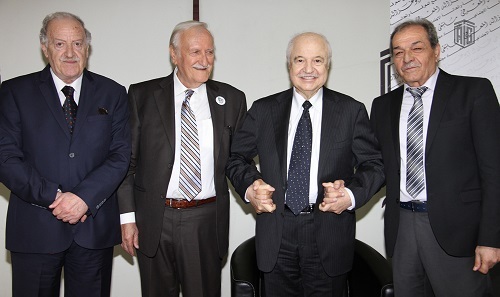 Meanwhile, Dr. Eid announced the granting of a long-lived Cedar of Lebanon to Dr. Abu-Ghazaleh since Lebanon was the country in which he received refuge during his childhood adding that Dr. Abu-Ghazaleh has always expressed his appreciation and gratitude to this great country.